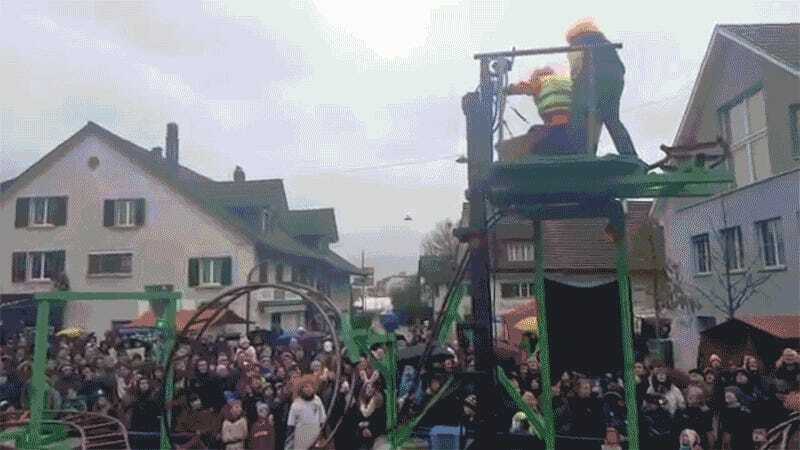 To help celebrate the annual festival of broken necks, the town of Bassersdorf in Zurich, Switzerland holds a parade featuring some of the most ridiculous floats you’ve ever seen, including one with a working roller coaster that Hollywood stuntmen would pass on riding. This video, posted by Rolf Zemp to YouTube, does have an odd jump cut in the middle, but we’re still confident that what we’re seeing here is legit—and completely unsafe. The one thing we are 100 percent certain of is that the concept of personal injury lawsuits hasn’t arrived in the small town of Bassersdorf just yet.